Manufacturer of a wide range of products which include stop watch racer, conductivity meter, deep vision instruments, hand refractometer and bunsen burner. We supply a compendious range of Timers/Stop Watches to our clients situated in different parts of the Indian Subcontinent. These products are particularly used for counting & controlling the timing in various industrial applications. Moreover, our range is also available in customized from to suit the diverse requirements of the clients. 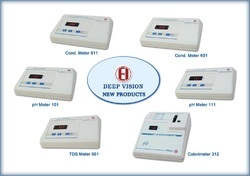 With our rich industry experience in this domain, our enterprise is providing a wide range of Conductivity Meter. Our offered conductivity meter is developed with basic material and modular tools, under the supervision of our experts. This device is notable for its high efficiency level and has wide usage for inline water quality conductivity analysis purpose. Offered meter is used in laboratories to determine the conductivity of sample. 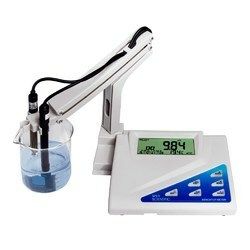 Hl 2300 Performs Ec, Tds (Total Dissolved Solids), percentage Of Nacl And "C measurements. The Auto-ranging feature For Ec And TDS measurements Sets The Highest Possible Resolution Automatically. All Measurements Can Be temperature compensated At 20 Or 25 DegreeC. The automatic temperature compensation (Atc) can also be disabled for measuring the actual conductivity and the compensation Coefficient Can Be User Selected. 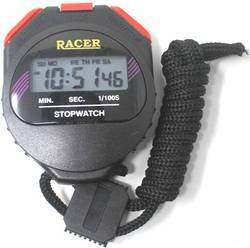 The stability indicator located on the LCD ensures accuracy. Conductivity readings are performed by applying an alternate current To The 4-Ring probe, Which Creates A Variable Voltage Directy Proportional To Conductivity. The Glp Feature Allows Users To Store And Recall Data About System Status. To Communicate With The Pc Use The (Optional) Hi 92000 Communication Software. This Software Provides An Exclusive Online Guide Of All The Commands Available And Allows Data Printing, Plotting And Exporting. The Ec And Tds Scales Are Autoranging. The Meter Automatically Sets The Scale With The Highest Possible Resolution. The Ec Probe Has A Built-In Temperature Sensor Which Is Used To Automatically Compensate The Ec/Tds Reading (From E9.9"C To L20.0"C). Using The Selected Reference Temperature. The Temperature Value, Shown On The Secondary Lcd, Can Be Manually Set With The Arrow Keys. The Compensation Is Referenced At The Selected Temperature. The "C" Tag Blinks When This Option Is Active. The Temperature Value Shown On The Secondary Lcd Is Not Taken Into Account. The Reading Displayed On The Primary Lcd Is The Actual Ec Or Tds Value. The "C" Tag Blinks When This Option Is Active. Nacl Calibration Is A One-Point Procedure At 100.0%" Nacl. Use The Hi 7037L Calibration Solution As A 100% Nacl Standard Solution. 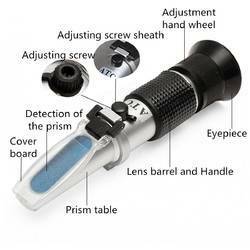 A traditional handheld refractometer is an analog instrument for measuring a liquid's refractive index. It works on the critical angle principle by which lenses and prisms project a shadow line onto a small glass reticle inside the instrument, which is then viewed by the user through a magnifying eyepiece.In use, a sample is placed between a measuring prism and a small cover plate. Light traveling through the sample is either passed through to the reticle or totally internally reflected. The net effect is that a shadow line forms between the illuminated area and the dark area. It is where this shadow line crosses the scale that a reading is taken. Because refractive index is very temperature dependent, it is important to use a refractometer with automatic temperature compensation. Compensation is accomplished through the use of a small bi-metallic strip that moves a lens or prism in response to temperature changes. There are many types of refractometers and the most common types are Abbe's refractometer, Pulfrich refractometer, Immersion refractometer. 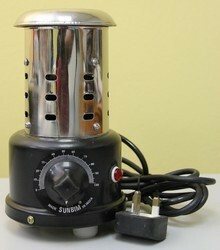 With years of experience in this domain, we have carved a niche for ourselves, in offering a high quality Bunsen Burner. Offered product is made of thick brass tube chrome plated screw type air regulator Deco paint light base. The given product consists of heating elements within a conical shaped refractory crucible which is enclosed in steel casting with proper insulation. This product is checked on various parameters so as to deliver a flawless range.